Gilbert Grappling’s Chase Beebe remains one of Chicago’s busiest fighters. The former WEC bantamweight champion fought six times for five different promotions in 2012, winning all six fights. 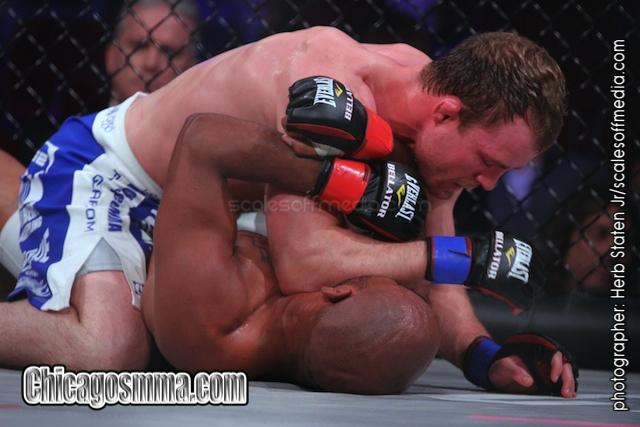 He suffered a set back at Bellator 90 in February, dropping a decision to Travis Marx. Next up for Beebe is a trip to Finland to fight Tom Niinimäki at Energia Arena. Having fought overseas in the past, it won’t be new for him, but it is always a challenge. “It’s different. It’s definitely an adjustment but I have grown to learn that a fight is a fight regardless of where you are and you have to find a way to win either way,” Beebe told Chicago’s MMA. Niinimaki (18-5) may not be a household name here in the states, but he is well-known in Europe and he will have his hometown crowd behind him in Finland. He’s won nine straight fights and has fought Hatsu Hioki, Bendy Casmir and Per Eklund. Local fight fans might remember Niinimaki from his fight against Tristan Yunker for Ironheart Crown back in 2006. Ray Flores recalls that Eric Moon flew Niinimaki in for the fight, and Yunker made him tap from a rear-naked choke just 1:34 into the first round. “He is a very tough opponent and I think it’s going to make for an awesome fight and a great show. I’m looking forward to competing against such a tough opponent. It will be a good test for me,” Beebe said. Beebe’s always up for a challenge. The main challenge with Niinimaki will be dealing with his ground game. He’s scored submission wins in five of the nine fights in his current streak. On top of fighting, Beebe and his brothers Carson and Conor own and operate Beebe Trained, a gym they opened late last year. Beebe Trained is in La Grange at 300 S. Washington, Unit D.